Heat oven to 200C/180C fan/gas 6. Tip the potatoes and onions into a large roasting tin. Scatter over half the ras el hanout, drizzle with 2 tbsp of the oil and toss together until completely coated. Put in the oven for 40 mins to roast, turning everything over once or twice so it cooks evenly. Meanwhile, heat 1 tbsp of oil in a frying pan and, one at a time, fry the fat side of the lamb well until dark brown, then remove from the pan. Remove the roasted veg from the oven. Season the lamb fat with the remaining ras el hanout, then drizzle or brush over the molasses. Put the lamb, fat-side up, among the potatoes and return to the oven. Cook for 20 mins for rare, 25 mins for pink and 30 mins for well done. Remove and leave to rest for 10 mins. Meanwhile, mix the thyme with the remaining oil and set aside. 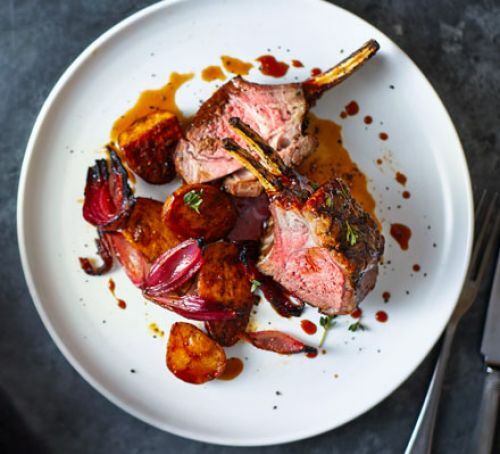 To serve, either bring the roasting tin to the table, carve the racks into chops and serve the potatoes straight from the pan, or remove the racks, cut them into thick three-boned chops, then spoon some of the potatoes onto each plate and rest a thick chop against them. Drizzle everything with the lemon thyme oil to serve. Heat oven to 180C/160C fan/gas 4. In a pan, cover the potatoes with cold salted water, bring to the boil and simmer for 5-10 mins until just cooked. Drain and allow to cool slightly, then cut into quarters. Heat a frying pan over a medium-high heat until hot, then add 45ml of the oil. Add the potatoes, along with the carrots and garlic. Season, toss to coat with oil, then add half the butter and rosemary. Once there’s some colour on the potatoes, transfer everything to a roasting tin and cook in the oven for 25-30 mins. Meanwhile, place an ovenproof frying pan over a medium heat and add the remaining oil. Season the lamb all over and, when the oil is quite hot, add it to the pan. Fry the lamb for 1-2 mins each side, using tongs to press down gently to caramelise and render the fat. Season again and put in the oven for 5-7 mins until just cooked. 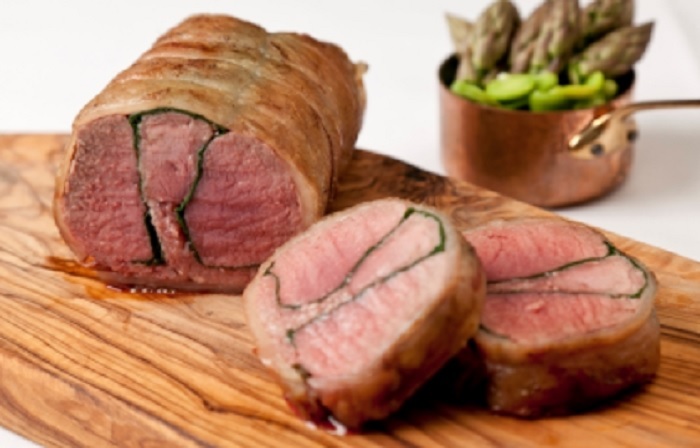 When pressed with your fingers, the lamb should have a bounce to it. Remove from the frying pan and set aside in a warm place. While the lamb rests, make the sauce. Add the red wine to the roasting juices in the frying pan over a medium-high heat. Reduce by two-thirds, then add the redcurrant jelly. Once the jelly has melted, add the lamb stock and reduce until it is the consistency of double cream. Once the sauce is nearly reduced, put a separate pan on a low heat and melt the remaining butter. Add the spinach to wilt and season. To serve, divide the potatoes between four warmed plates. Cut each piece of lamb into about five slices and place next to the potatoes. 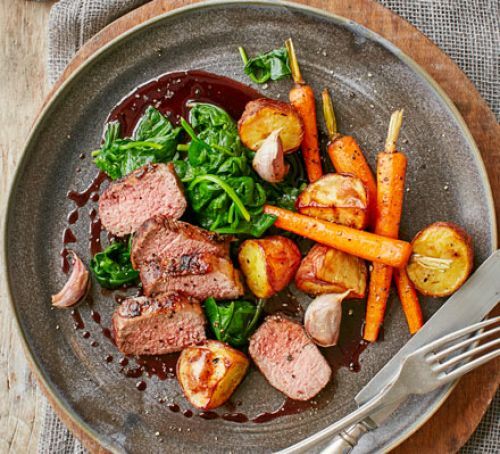 Arrange the carrots and spinach around the lamb. Spoon the sauce over everything and decorate with pieces of garlic and rosemary. Scatter a pinch of salt over each plate and serve. Trim and slice the celery. Wash, trim and thinly slice the leeks, peel and thinly slice the onions and peel and finely chop the garlic. Roughly chop the lamb. Heat the butter and oil in a frying pan and sauté the celery, leeks, onions and garlic for 5 to 7 minutes, or until softened. Add the leftover lamb and cook, stirring occasionally, for 2 to 3 minutes. Transfer to a bowl and set aside to cool. Preheat the oven to 180ºC/gas 4. Lightly grease a shallow 30cm x 40cm roasting dish. Peel, dice and parboil the potatoes, and parboil the rice. Pick the parsley leaves and finely chop the stalks. Hard-boil, peel and quarter the eggs. When the lamb mixture has cooled, crumble in the feta and add the currants or raisins, potato, rice, cinnamon, oregano, mint and parsley and mix well. Set aside. Lay 1 sheet of filo in the roasting dish and brush with melted butter. Repeat until you have used all of 1 packet. Spread the lamb filling over the pastry, then top with the hard-boiled egg quarters, lining them up in 4 rows. Place 1 sheet of filo from the second packet of pastry on the filling, brush with melted butter and continue layering until you've used all the pastry. 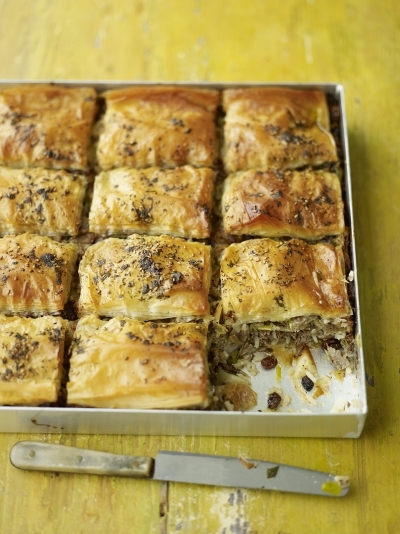 Sprinkle over the za'atar and cut the lamb pie into 16 squares, making sure each square contains some egg. Drizzle over a little cold water and bake in the oven for 1 hour, or until the top is golden and the pie cooked through. Allow to cool slightly before serving. Place 2 litres of water and 2 teaspoons of sea salt into a large pan, then place over a high heat and bring to the boil. Peel and add the whole onion and the lamb. Bring back to the boil, then use a spoon to skim away the scum from the surface. Simmer for a further 10 to 15 minutes, or until cooked through. Using a slotted spoon, remove the meat from the pan and leave to cool. Strip the meat from the bone, then return the meat to the pan. Peel and cut the swede into 1cm chunks. Add to the pan and bring to the boil, then simmer for 15 to 20 minutes, or until the swede is tender. Peel the carrots and slice at a slight angle into 1cm chunks, then add to the pan. Bring to the boil, then simmer for a further 15 to 20 minutes with the lid on, or until tender. Meanwhile, peel the potatoes and cut into quarters so they’re all roughly the same size. Once the carrot has softened, add the potatoes to the pan and repeat the process until tender. Peel the parsnips, strip and discard the outer leaves from the leeks, then cut into 1cm slices. Add the parsnips and most of the leeks to the pan. Bring to the boil, then simmer for 10 minutes with the lid on, or until tender. Taste and season, then add the raw leeks. Place the lid on top, then pop in the fridge to chill overnight (or for up to 3 days for even tastier results). When you’re ready to serve, gently simmer the cawl until warm. 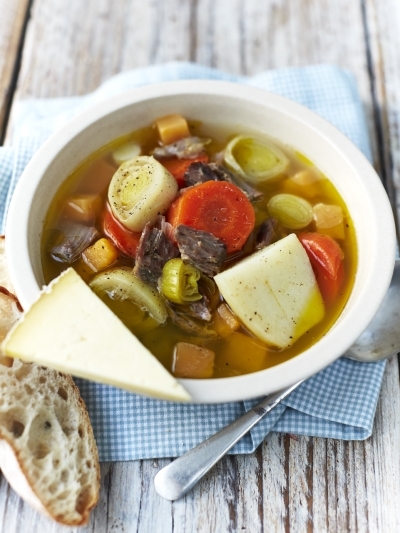 Ladle into serving bowls, then serve with lots of black pepper, a wedge of mature Caerphilly cheese and a slice of bread and butter.